Sophomore Justin Mazzulla dribbles the ball around Massachusetts defenders during a men's basketball game earlier in March. Men’s and women’s basketball won a combined 19 games this season, the fewest combined wins for the Colonials in three decades. The teams have traded off skidding over the years and each program has dipped below their records on the 2018-19 season, but rarely have both teams experienced rough patches in tandem. Entering this season, expectations for both programs were high. Men’s basketball (9–24, 4–14 A-10) entered the year coming off the program’s first losing record in five years, but the squad was driven by a goal of rebuilding a program around a group of inexperienced players who former head coach Maurice Joseph likened to the 2016 NIT Championship squad – overflowing with potential. 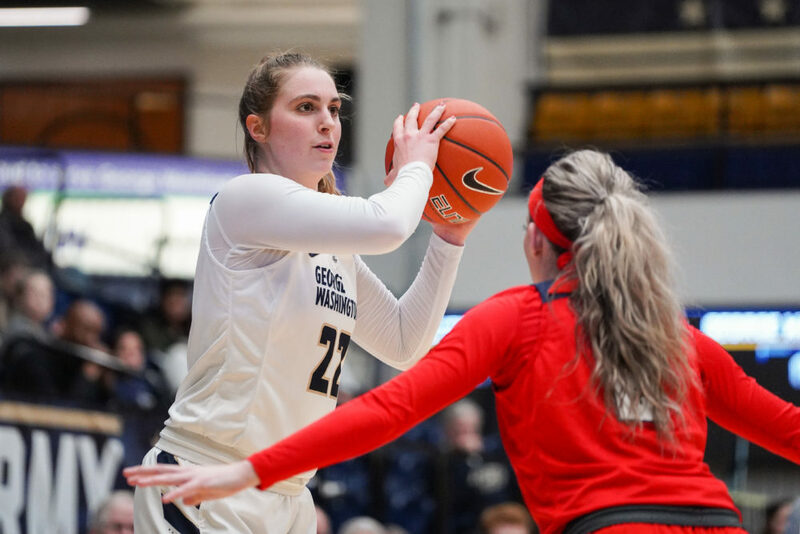 On the women’s side, despite a youthful roster and only two returning seniors, GW (10-20, 7-9 A-10) was projected to be in position to defend its A-10 Championship crown. But as the season came to a close, it was clear that neither team’s expectations came to fruition. Men’s basketball ended the season with the lowest win total for the Colonials in more than a decade in its lowest conference finish in 10 years. Just one day after the team fell in the second round of the A-10 Championship, the athletic department fired Joseph and his slate of assistant coaches and said the move was necessary to restore a winning culture in the program. Women’s basketball was thrown out of postseason play with a 61–49 loss to Saint Joseph’s in the first round of the conference tournament. The team’s position as the No. 9 seed is the lowest ranking in A-10 play the Colonials have finished with in seven years. The men’s squad was slated to finish in the bottom of the conference. The team had rebuilding on the mind heading into the year, and their experience was evident as the Colonials failed to piece together consistent stretches of play throughout the season. 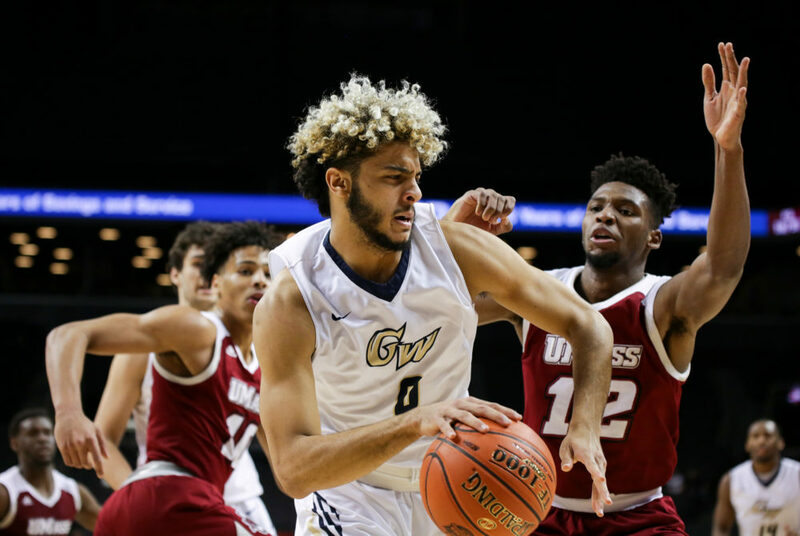 The Colonials’ season-opening overtime loss to Stony Brook after carrying a 22-point lead set the stage for a year that saw GW both erase and relinquish double-digit leads. With 11 games left in the regular season, GW had yet to piece together a full strong game and Joseph chalked up the missteps to turnovers and missed shots. After showing flashes of improvement at the beginning of the team’s conference slate, the Colonials entered the postseason tournament riding a five-game losing streak which included a double-digit loss to a Fordham team GW had defeated by 18 points earlier in the year. “Obviously we didn’t get the results that we wanted throughout the course of the year, we’re disappointed with the season that we’ve had overall, obviously,” Joseph said after GW was knocked out of the A-10 Championship. Joseph did not return multiple requests for comment. An athletic department spokesman declined to facilitate interviews with student-athletes. The Colonials’ struggles with consistency led them to tally fewer points per game and shoot fewer baskets at a lower percentage than the previous year. The 63.5 points per game average on the year is the Colonials lowest since 2011-12. On the post, the Colonials were short-staffed after junior forward Arnaldo Toro tapped out for the season with an injury. Sophomore forward Javier Langarica was forced to step up and take over Toro’s role and while Langarica posted double-digit rebounding games in five of the final six games of the season, his team-leading 5.3 rebounds per game was not enough to make up for Toro’s production. Freshman Maddie Loder looks for an open teammate during a women’s basketball game against Duquesne in February. Despite being pinned as a contender for the A-10 title by fellow conference coaches, women’s basketball expected ups and downs as the group of four freshmen and six sophomores – including three transfers – played together for the first time. But GW finished as the fifth-lowest scoring offense in the nation, averaging 51.3 points per game, and the team’s 10 total victories are the fewest for the program since the 2010-11 season when the Colonials finished 8–21. Before the season kicked off, Rizzotti said she was going to be relying on the team’s six sophomores to make strong contributions off the bench and in the starting lineup. But she struggled throughout the season to find players who could perform to her standard. Redshirt sophomore forwards Sarah Overcash and Olivia Gumbs were tabbed as some of the players Rizzotti would be looking to contribute high numbers off the glass this season. Overcash started the first 12 games of the year but was relegated to the bench after GW’s game against William and Mary Dec. 29 and ended the season averaging 2.0 points per game. Gumbs tallied just two starts and averaged 1.9 rebounds and 2.7 points per game. With the team set to return 10 members of this season’s squad, the next step for the Colonials will be to take ownership of the next-player-up culture Rizzotti has been establishing throughout the year.